LDS Money Blog: Frugal Giveaway! Today, you get a bonus Frugal Tip AND a giveaway! 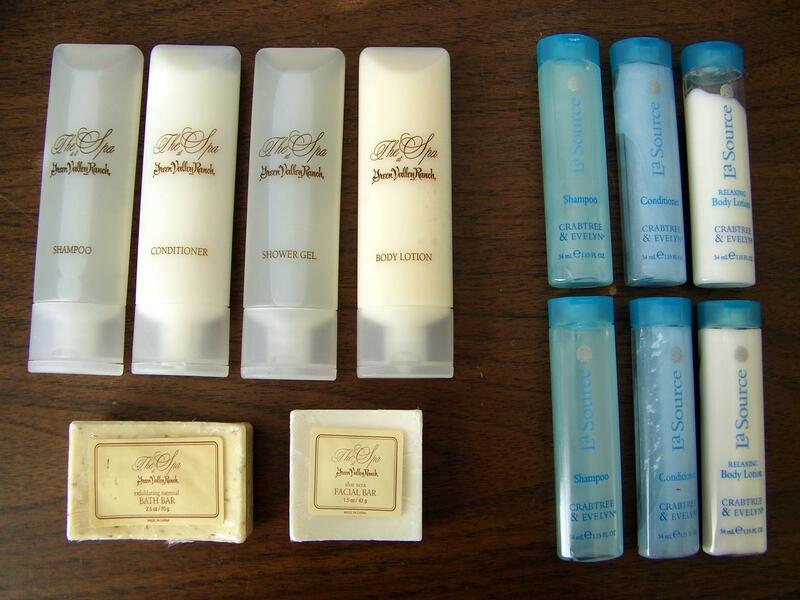 Whenever we stay at a hotel, I always collect the shampoos and soaps. Not because I'm a fan of hotel hair care but because there are good uses for them aside bailing you out when you forget your own personal care goodies at home. 1. My local soup kitchen welcomes the small-sized personal hygiene items for when homeless people come in to use the showers. 3. These hotel sets are AWESOME for 72-hour kits and emergency kits! They're small and each bottle has just enough product to last 2-3 uses. 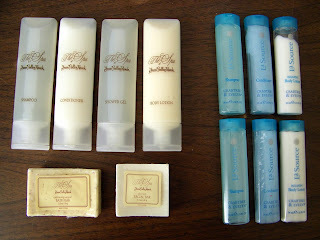 Below are three groupings of shampoo/conditioner/lotion/soaps. To enter this little giveaway, leave in the comments a frugal tip of any type that helps you save money and may help other women do so, too. Along with your suggestion, tell me which set you would rather win, if you have a preference. 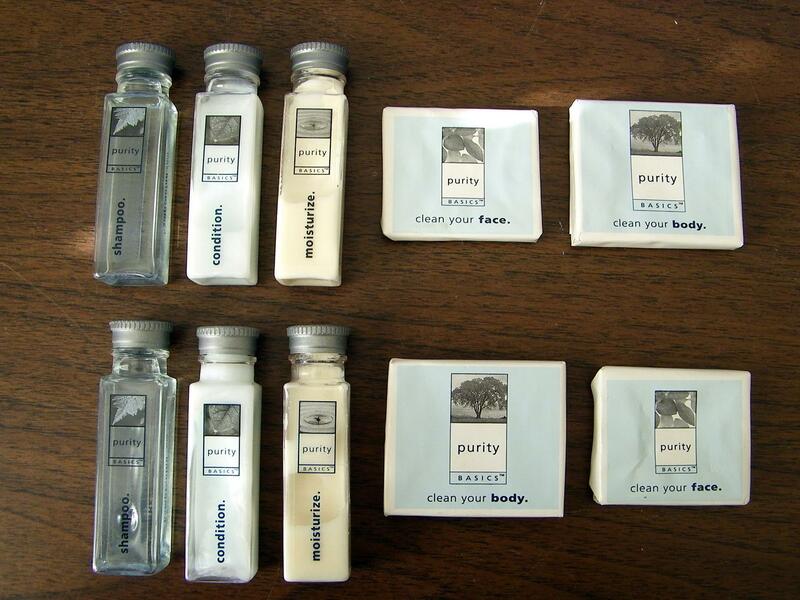 I will randomly select three winners to receive the hotel sets, but all who submit suggestions will be considered for future Frugal Friday posts. All other frugal tips submitted will still be considered for future use on the blog. You may see your suggestion and your smiley face on a future Frugal Friday post! Giveaway closes Thursday, February 3, 2011 at noon Mountain Time. My frugal tip is finding use for everything. 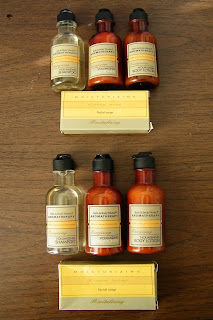 I frequently re-purpose cardboard packaging for extra storage, such as in the bathroom to corall the little samples! I would prefer group 1. Keep old prescription bottles to use as little storage containers. I use mine to store bobby pins, hair ties, paper clips, and tacks. If I get a choice, I'd like the first set. I love those! Just found your blog and love all the little tips! I've found that, as far as washing your hair goes, your hair creates enough oils to replenish what the shampoo strips off- the more often you wash your hair, the more often it needs washing. If you can back off on the washing (though there may be a few days of adjusting) you won't have to wash it everyday. Only having to wash my long, thick hair every other day or every two days sure saves on shampoo and conditioners! I was skeptical at first to see if it would clean my husbands clothes after a day of riding horses and branding cows, but they came out clean and fresh smelling. I make a huge batch of this (everything X's five and it lasts me doing at least 8 loads of laundry a week, for four months) and the total cost is only about $15 for four months is a steal! Frugal Tip: When shopping I HIGHLY recommend PRICE MATCHING AT WALMART! I think this is such an AWESOME thing! You can bring a grocery ad from any competitors ad in the area and price match ANYTHING! I have talked to Walmart's corporate to clarify and if Smiths has a buy 10 get it for 1.25 say, they price match to the 1.25 as long as the 1.25 is listed in the ad! So instead of running around wasting time and gas going to 10 stores, you can price match all at Walmart and get all the stores loss leaders prices in one shopping trip. This is a good alternative if you don't use coupons or if you tend to buy a lot of fresh produce items like I do! It works great, the cashiers know how to easily do it and usually don't mind! I would LOVE the Bath and Body set! I LOVE Bath and Body Works Aromatherapy but all of them look great! Thanks for the cool giveaway and I love that I found your blog! When I receive a gift for Christmas or my birthday I reuse the gift bag that it came in. And I also use the wrapping paper that some stores put in your bag when shopping. Whenever I see the option to request a free sample of Coffee or Tea I do so. I personally don't drink either, but my grandparents and some other family members do, and it's a great gift to send to them for bithday's or Christmas. This may seem obvious, but learn to do simple repairs. You can patch kids' jeans on the inside with iron-on patches (no one will ever know) and sew things back together when they seem hopeless. I'm amazed how often my friends buy new things when they could have easily fixed the old ones. (I've learned a lot of my repairing just by googling it!) Anybody can learn to sew with a needle and thread - give yourself a little credit. Buy some clear fishing line thread and you can fix anything. my frugal tip: Shop the clearance sales for next year! I try to buy clothes a year ahead for my kids when they are on clearance. Also toys. Target and Walmart both offer awesome after Christmas Clearance sales. I stock up on toys and then when my kids have a birthday party to go to, they can pick something out without having to pay full retail. I go to all the freebie sample sites on the internet. I have received samples of medicines toothpaste,TP,shampoo, you name it you can get a sample.I use these for car kits, 72 hr kits, when kids go to camp, vacations and my purse.